Dr. Vijay Aluri is a rheumatologist currently serving patients at Physicians’ Clinic of Iowa in Cedar Rapids. His specialties include rheumatoid arthritis, psoriatic arthritis, drug-induced vasculitis, and musculoskeletal ultrasound in rheumatology. Dr. Aluri received his MD at Jawaharlal Institute of Postgraduate Medical Education and Research (JIPMER) in Pondicherry, India. He completed his Residency in Internal Medicine at the University of Missouri – Kansas City School of Medicine and completed his Fellowship in Rheumatology at the University of Iowa Hospitals and Clinics in Iowa City. Dr. Aluri is certified by the American Board of Internal Medicine and by the American College of Rheumatology. Dr. Aluri’s philosophy is to treat patients as persons first, with integrity, respect, and compassion. “I believe in honesty, transparency and safety for every patient, every day. I strive to personalize care to reflect the patient’s needs, values and choices,” states Dr. Aluri. 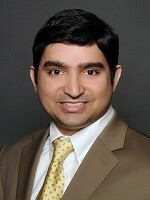 In his free time, Dr. Aluri enjoys playing tennis, table tennis, chess, and the guitar, and also enjoys traveling. Join Dr. Aluri in the fight against arthritis, register or donate today! Denver was diagnosed with juvenile idiopathic arthritis (JIA) in 2012 when he was 13, but the road started about two years before that. 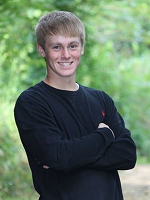 Adolescence is a challenging time for everyone, and it proved to be even more difficult living with what he thought were “growing pains.” Denver struggled doing everyday tasks like bending over to tie his shoes, running during gym class, and playing sports. He was a very active kid, but the pain he was experiencing was making it difficult to stay active. Denver and his family searched for answers through physical therapy and chiropractic treatments. Many times, he was told he had inflammation in his sacroiliac joint, but no treatment seemed to stick. Finally, after an MRI and a second medical opinion, Denver was diagnosed with JIA. Looking ahead after his diagnosis seemed scary because there were so many questions. Denver had no idea what JIA meant for his future goals and aspirations. Diagnosis, however, finally gave a comforting message to the question of why. Through medication he was able to be a normal kid again. Denver could fully participate in skiing, football, weight training, and baseball without trying to explain why he wasn’t 100 percent. In 2017, Denver graduated from Wahlert Catholic High School in Dubuque as a two-sport athlete, and participated on the Sundown Junior Alpine Ski Team for twelve years. Today, he attends St. Olaf College in Northfield, Minnesota, studying biology and environmental studies. Denver competes collegiately on their alpine ski team. Denver is thankful to all of his family, friends, medical professionals, and mentors who have walked the road with him. It’s Denver’s goal today to share his experiences to help all who might still be suffering like he was, and to see a world where no one will have to suffer from inflammation. Join Denver in his fight against arthritis, register or donate today! My name is Ashlyn Henkes. When I was nine, my neck started to hurt. It was to the point where I couldn’t move it to look around. Even looking up and down hurt. My fingers hurt to write, chewing hurt, walking two blocks home from school was difficult too. My feet hurt really bad. My parents took me to the clinic. We decided to try physical therapy. I was doing that until Angie, my physical therapist said, “This is not working.” She decided to send me back to the doctor for more tests. I ended up going to Children’s Hospital in Iowa City. Dr. Hong diagnosed me with polyarticular juvenile idiopathic arthritis. A few months later, I had to go to a neurosurgeon and get a neck brace. I wasn’t able to do any sports or even jump! I was disappointed, but I tried not to show it. When I thought things couldn't get any worse, infusions came, and I had to do them every other week. I wasn’t too frightened by the IV, but my siblings were a different story. So, I was relieved it was me and not them. The following year, I switched to shots instead, so we didn’t have to drive so much. I was also released from wearing my uncomfortable and embarrassing neck brace. Really, the main reason I hated it was because people would ask me questions about what happened or how I broke my neck. I didn’t even brake it! I hated how ugly it was and it made me very unhappy. Now I am twelve years old. I can do some of the things now that I couldn’t do before, but I’m still disappointed that I can’t do all of them. Thank you for listening to my story. My family and I will continue to walk for a cure! 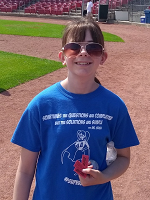 Join Ashlyn in her fight against arthritis, register or donate today!